During SXSW Interactive in Austin, Loopt, a location-based mobile service which launched a rewards program March 1, saw a 33 percent increase in check ins compared to the median over the past three weekends in Austin. For the push notifications, the service saw a 13 percent click-through rate to the fully branded reward page. 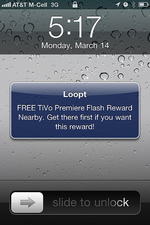 For a program run specifically for Southwest Airlines, Loopt saw saw 22 percent of people who got the phone notification drop what they were doing to come and get the reward. With the company's Reward Alerts, brands and local businesses can offer limited-time and perishable-inventory deals to nearby consumers. 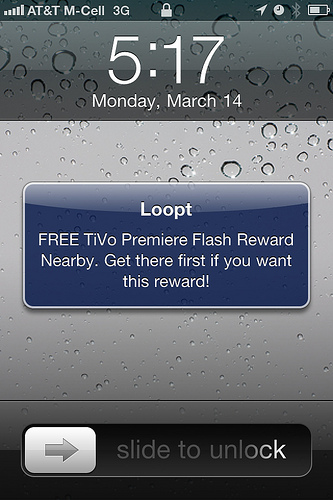 Reward Alerts help companies offer a "flash" deal that is immediately redeemable in person, instead of a deal that is purchased now, but used at a future date. The new local deal alerts add to Loopt's existing Friend Alerts, which send users a notification when a friend is nearby.